Mars, our second closest planetary neighbor, is a cold and desolate place. Extreme conditions make it near impossible to support liquid water on the planet’s surface, but thanks to recent weather and soil data collected by NASA’s Curiosity rover, scientists have their first indirect evidence of the presence of a thin briny film near the equator. Thanks to a natural anti-freeze, the brine pulls water from the atmosphere into the soil, but daytime temperatures are too high, and any liquid evaporates. With the help of robotic probes, scientists on Earth have been studying the Red Planet for decades in hopes of finding any evidence there once was life. NASA’s Jet Propulsion Laboratory (JPL) landed the Mars Science Laboratory, more commonly known as the Curiosity rover, on the surface in August 2012 and has been analyzing rock samples in order to learn more about our second closest neighboring planet. Both Curiosity and NASA’s Phoenix Mars Lander mission have detected perchlorate in Martian soil. The perchlorate facilitates the absorption of water vapor from the atmosphere and helps to lower the freezing temperature of water. This has been proposed for years as a mechanism for possible existence of transient liquid brines at higher latitudes on modern Mars, despite the Red Planet’s cold and dry conditions. Curiosity collected more than a year’s worth of temperature and humidity measurements. New calculations, based on those measurements, indicate that conditions at the rover’s near-equatorial location were favorable for small quantities of brine to form during some nights, but drying out again after sunrise. Higher latitudes proved to be more favorable as colder temperatures and more water vapor yield higher relative humidity. 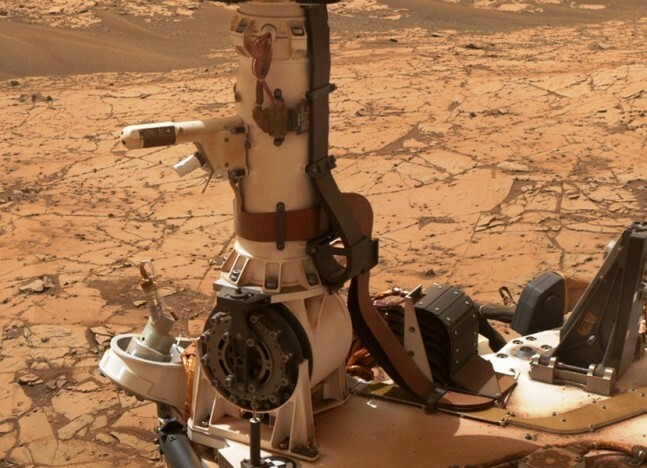 The weather data was collected by Curiosity’s Rover Environmental Monitoring Station (REMS), published in Nature’s Geosciences journal, was provided by Spain and includes both a relative-humidity and ground-temperature sensors. NASA is using Curiosity to investigate both ancient and modern environmental conditions in Mars’ Gale Crater region. “We have not detected brines, but calculating the possibility that they might exist in Gale Crater during some nights testifies to the value of the round-the-clock and year-round measurements REMS is providing,” said Curiosity Project Scientist Ashwin Vasavada of NASA’s Jet Propulsion Laboratory, Pasadena, California, one of the new report’s co-authors. Curiosity is the first mission to measure relative humidity in the Martian atmosphere close to the surface and ground temperature through all times of day and all seasons of the Martian year. Relative humidity is proportional to the temperature of the air, and the amount of water vapor in it. Curiosity’s measurements of relative humidity show a broad range, with only about five percent during summer afternoons to 100 percent during autumn and winter nights. Air filling pores in the soil interacts with air just above the ground. When the relative humidity rises above a certain level, salts can absorb enough water molecules to become dissolved in liquid – this process is called deliquescence. 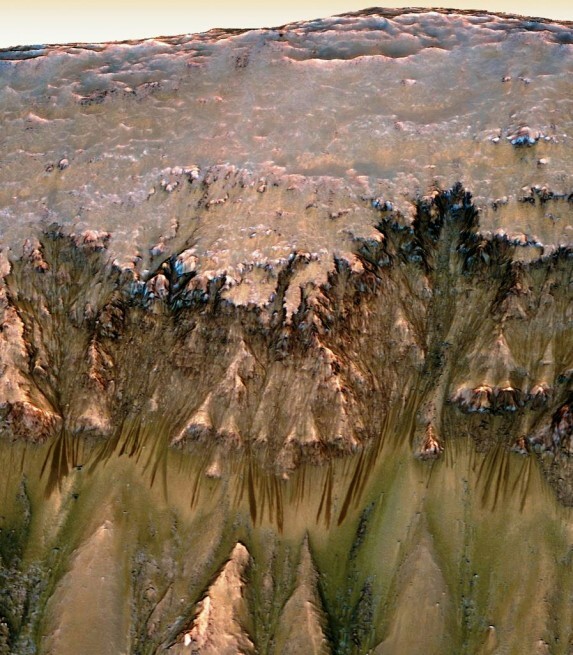 Perchlorate salts, like the ones detected in the Martian soil, are especially good at this. Perchlorate has been detected at near-polar and near-equatorial sites, leading scientists to suspect it may be present in all Martian soil. Researchers using the High Resolution Imaging Science Experiment (HiRISE ) camera on NASA’s Mars Reconnaissance Orbiter (MRO ) have documented many areas on the Martian surface known as recurring slope lineae or RSL. The RSL are dark flows that appear on slopes during warm seasons. While scientists do not know for certain what causes them to form, one prominent prediction involves brine formed by deliquescence. “Gale Crater is one of the least likely places on Mars to have conditions for brines to form, compared to sites at higher latitudes or with more shading. So if brines can exist there, that strengthens the case they could form and persist even longer at many other locations, perhaps enough to explain RSL activity,” said HiRISE Principal Investigator Alfred McEwen of the University of Arizona, Tucson, also a co-author of the new report. 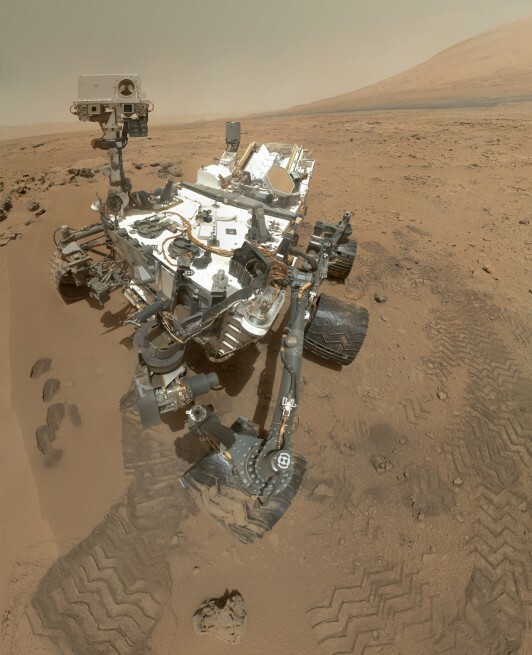 In the 12 months following its August 2012 landing, Curiosity discovered evidence for ancient stream beds and a lakebed environment more than 3 billion years ago that may have once supported microbial life. Currently, the rover is examining a layered mountain inside Gale Crater to better understand the evolution of ancient environmental conditions. SpaceFlight Insider is a space journal working to break the pattern of bias prevalent among other media outlets. Working off a budget acquired through sponsors and advertisers, SpaceFlight Insider has rapidly become one of the premier space news outlets currently in operation. SFI works almost exclusively with the assistance of volunteers. Would have been nice to record digital video of 500mL of water pored on Martian soil. She may be pretty and enthusiastic but she wants to google distance to Venus. Why are the photos so blurred?